Chances are if you work in finance you read The Wall Street Journal. And chances are if you read The Wall Street Journal you've read or at least glanced at the Journal's most popular article of the week thus far: "Why Chinese Mothers Are Superior." 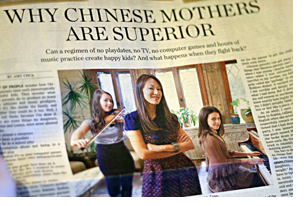 In it, Amy Chua, a Chinese mother (and writer and lawyer) living in America, points out the differences between how her children (and other children of Chinese mothers) have been raised and how most children with plain old American mothers have been raised. After reading Chua's controversial piece (it has garnered 3,638 comments as of 3:30 p.m. today) I immediately had two disparate thoughts: (1) my own strict (not Chinese) mother now seems like Mother Theresa in comparison to Chua and (2) Chua (and other Chinese mothers) treat their children not all that different from how investment banking managing directors treat their underlings. Which explains several things, including those 100-hour workweeks. Allow me to explain. Exhibit A. Chua writes, "Chinese parents demand perfect grades because they believe that their child can get them. If their child doesn't get them, the Chinese parent assumes it's because the child didn't work hard enough. That's why the solution to substandard performance is always to excoriate, punish and shame the child. The Chinese parent believes that their child will be strong enough to take the shaming and to improve from it." Similarly, managing directors demand perfect financial models, perfect pitchbooks, perfect management presentations, etc., because they know the kid who has graduated with a 3.87 or above at one of the top 10 schools in the country can do perfect work. And if an analyst or associate doesn't provide perfect work, it's surely because they didn't work hard enough. To boot, an MD knows that every one of his junior bankers is man (or woman) enough to take a thrashing in front of the entire deal team and a handful of administrative assistants if said man or woman fails to provide perfect work. Exhibit B. Chua writes, "Chinese parents believe that their kids owe them everything. The reason for this is a little unclear, but it's probably a combination of Confucian filial piety and the fact that the parents have sacrificed and done so much for their children. (And it's true that Chinese mothers get in the trenches, putting in long grueling hours personally tutoring, training, interrogating and spying on their kids.) Anyway, the understanding is that Chinese children must spend their lives repaying their parents by obeying them and making them proud." Similarly, MDs believe that their analysts and associates owe them for everything, including their daily bread. How else would analysts and associates get paid if the MDs weren't out there, night after night, wining, dining and whatever else it is they need to do to convince company X that company Y will be one hell of an acquisition? MDs are on the road, at the very least, 50 percent of their workweeks. Do you think they like spending that time away from their wives and kids? (Don't answer that.) Anyway, there is most definitely an understanding on Wall Street that analysts and associates must salute, obey and honor, at every turn, on every conference call, in every meeting, their trusty managing directors. Exhibit C. Chua writes, "Chinese parents believe that they know what is best for their children and therefore override all of their children's own desires and preferences. That's why Chinese daughters can't have boyfriends in high school and why Chinese kids can't go to sleepaway camp. It's also why no Chinese kid would ever dare say to their mother, 'I got a part in the school play! I'm Villager Number Six. I'll have to stay after school for rehearsal every day from 3:00 to 7:00, and I'll also need a ride on weekends.' God help any Chinese kid who tried that one."